F2p.com is teaming up once again with Gamersfirst (Reloaded Productions Ltd), to offer you 2000 more of these delicious Kraken Free Item Packs and 10 days of premium for APB Reloaded. The Squad Support Weapon is Nekrova's answer to a lack of support for troops using their N-TEC 5s. This weapon provides long-range suppressive fire while retaining mobility that competitors do not have. This unique variant comes with a sight for increased accuracy, increased fire-rate and a drum magazine for extra ammo. • Hunting Sight 3 - Increases benefit of Marksmanship mode substantially, increases zoom level by +5 degrees, and decreases accuracy when running. • Up to a 90% bonus to all Contact Standing (XP) gains! 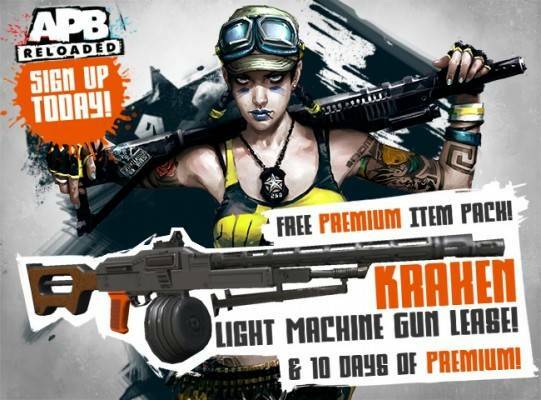 • 125% bonus to all APB$ (in-game currency) gains! • 20% discount in the Armas Marketplace! • 50% reduced cooldown on activated abilities! • Advanced access to customization suites (up to 100/50/50)! • Extended duration for free Armas trials! Step 3. Create a new account for APB Reloaded on the official site between 2013-10-30 and 2014-01-01 (midnight UTC) in order to redeem this code. Step 4. You will need to log in to APB and create a character. Step 5. Then go to the in-game marketplace and click “Redeem Code”, and enter your code and click "Redeem Code".